My name is “Ti double G ER”! My foster mom thinks I act like a Pooh Character. My name has been changed a lot since moving into my foster mom’s house. I still do not come when called but it seems to fit my personality. My history is I am a transplant from NJ. My first family had some medical problems and a new child. Me and my best friend were shipped to Washington . My new owners had cats and I just wanted to play with them. They did not know how to handle me so I came to my foster home. I was sad when leaving my friend but my new home has 3 dogs for me to watch. 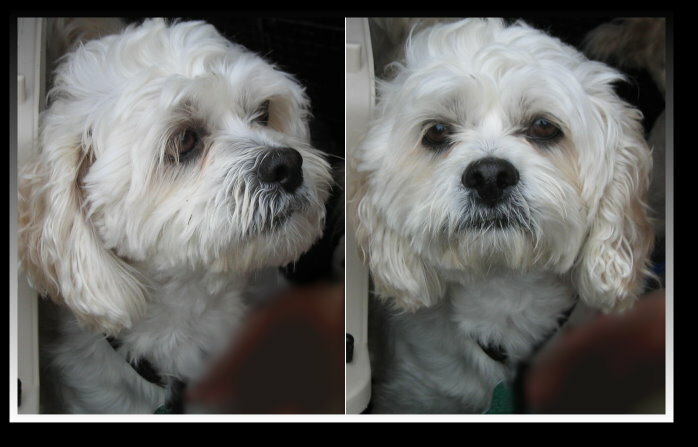 I am three years young, and have a big Lhasa ‘tude! I love people food and any food left unattended is mine. I will escape if you don’t watch me like a hawk. I like to sit next to you, and will follow you all over. I love to go for walks but prefer to do it when it is sunny. I am house broken and will tell you when it is time to go outside. I love to go for car rides. I am well behaved inside of stores or walking with my 3 buddies from the foster home. My foster mom is working with me at night with the crate; she thinks she can make me like it but my Lhasa ‘tude will win out. I get brushed out each night with a snack before bed and outside visit. She says I will have a beautiful coat once it is a bit longer. I lay at her feet watching the other dogs play or chase each other. She tells me I am the good dog out of her three. She says I have beautiful eyes and will get a home that will love me; she promised me a good family will make me theirs! The perfect family for me would be teenagers who want me to tag along, another dog for me to play with, long walks (no rain please) a bowl full of food, someone home all day, no crates and lots of love. I promise to be there when you open the door. Ready for Fast Times at Ridgemont High? Spicoli's former owners welcomed him into their lives as a puppy and lived well with him for half a dozen years. After having two babies, the young couple decided to give him up to rescue. Spicoli will be placed in an adult only household. He warms up slowly and should NOT be pushed to show affection. He is extremely shy at first and needs a lot of reassurance, encouragement and trust building. Staying on the edges of rooms and being cautious, Spicoli is almost a ghost dog at first in a new environment. There is a wonderful cream puff lover under that wary, sometimes growly Lhasa exterior. He seems to prefer men. Spicoli can have a Lhasa Bad Boy front pop up. Once past the growly warning, he lays down, flattened to the floor in an extremely submissive pose, sure that he is going to be punished or scolded. True to the breed, if he thinks someone is threatening him or HIS human pets, he can look and sound very menacing. But this is a dog that will definitely be laying at your feet on the bed from day one, bounding up onto the bed without a question or doubt that it’s the proper place for him to sleep. No doggy beds at night for him! Try to pet him there before he is trusting and ready and he will leap off and away instantly, only returning when he feels that he is not noticed. So sad! Staying on the edges of rooms and being so, so cautious, Spicoli seems almost a ghost dog at times when he is unsure about his surroundings or what people expect of him. Spicoli does not seem to have had much training, but he learns quickly and sits for treats quietly. If he thinks he has done wrong, he will zip off to the opposite end of the house, only coming out later, cautiously, quietly to see if he is safe. On the other hand, once he decides he wants attention, leaping with assurance into the chair or bed to cuddle and get a head/neck fluff up. Chasing squirrels or birds from the hanging feeders is a favorite past time for him, so he may chase cats, we just don't know. He does fine with other dogs his size, not yet to the point of playing with them individually, but will happily romp and run along with the other dogs at his foster home. Spicoli uses a doggy door and needs a home with fenced yard. 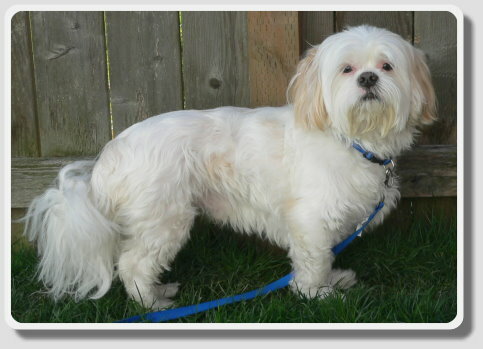 A very handsome fellow with personality, Spicoli needs an experience Lhasa owner with knowledge about the breed or similar minded sensitive, occasionally stubborn dogs. Someone with patience and resolve to work with him thru growly periods and reintroduce him to visitors and walks as positive, rewarding experience. A person who will work with him, be his leader and show him how to be the great dog that he can become. A super home was found for this boy. I love Louie, he has so much potential, and so much love and loyalty to give to the right owner. 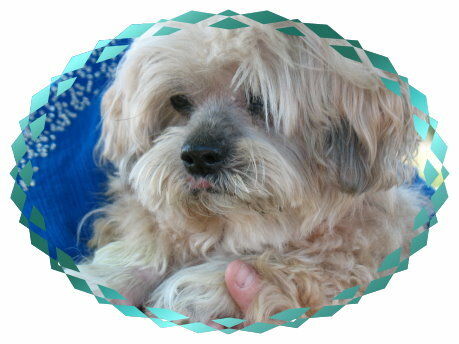 Goldie is a gentle Lhasa/Poo who is waiting for a safe, easy going home to spend her retirement years. She was a matted and flea bitten stray, lost and neglected. Her ears were in absolutely horrible condition, causing her to scream in pain if you even touched them. Obviously untreated ear infections had raged for a very long period. Due to this, her hearing is very poor, she can hear a sharp clap, but not much else. Meal times find her underfoot, waiting hopefully for a handout or a dropped morsel. Nothing wrong with her sense of smell! Goldie loves to sleep on her soft bed in her own crate, where she retires to avoid the hubbub of the other fosters. Occasionally she asks to be up on the couch with her foster mom and the other dogs, settling down quietly for another nap. Goldie lets the other dogs do the playing and running, she is all for relaxing and enjoying her golden years. Her tangled mats are long gone now, she is bathed and brushed regularly so her fur is coming back nicely in the areas that were bleeding, raw and sore when she was first found. Goldie will need consistent flea protection since she seems to have developed a sensitivity to their bites. She has responded very well to the diet of dry duck and potato kibble, with only healthy treats and supplements for her joints and skin recovery. She uses the dog door to take herself outside for potty needs, walks well on a leash and enjoys the occasional ride in a car, smelling all the new smells and seeing the world go past the windows. Her main activities are sleeping in her bed, checking out the yard and a nice sunny spot for a snooze, inspecting kitchen floor's nooks and crannies for yummies. She needs daily drops for dry eye and twice a day medication for a low thyroid. Goldie is an easy dog to work with, tolerant of grooming, eye and even ear care and she seems thankful for almost any tender attention. UTD on her vaccinations, full dental already done, microchipped and ready for that loving home that appreciates the more mature dog. A dear older girl that is not demanding. A wonderful home was finally found for this sweet gal in Langley, B.C. We wish these lil furbabies could speak and tell us their story. We find when you live with them, watch them, nurse them, hold them...their story unfolds. This boy was loved enough to be taught house manners, understands crates well...but whoever did have him, taught him to roughhouse with their hands, as a result, he needs to be reinforced that he should not be mouthy. Men and children tend to do this rough way of playing, and it is NOT good. Now if you want a floppy puppy, who loves to flop on you, cuddle with you, curl up with you, be your best friend, Finley may be the baby for you. Finley came in very sick with kennel cough, once he got over that, he had to be groomed, this boy, may have been groomed once before...as a result his once beautiful coat, had to be shaved, his nails so long, they were like cat claws...considering his lack of grooming in his short life, he did well...he protested, but in the right hands with the right groomer he will be fine. Finley likes other dogs, and does well with the friendly ones, but gets intimidated by the bully dogs. I would prefer a home with good understanding of dogs...and no young children. Daisy loves to play with stuffed toys and balls though her attention span is short. She likes to be petted, on her conditions, and being the true Lhasa loves to lie by your side, facing the outside world ready to protect you. She can be too protective and has lhasatude. 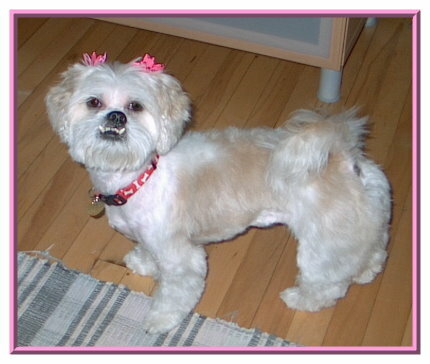 She was groomed without incident and turned out beautifully but did not want her face or feet messed with. Apparently learning that she was going to have to put up with it she settled down and stood quietly for the rest. She loves to go for walks and loves being outside. Her coat is long and flowing and since she doesn’t like brushing ( she will tolerate a little), she maintains her coat quite nicely without a lot of attention. She is in beautiful condition physically, very slim but not skinny. She is quite the jumper if she is happy to see you. Daisy wants to be wherever you are but will sleep on the floor at your feet or on a doggy pillow beside the bed. This is what she prefers. She is somewhat reserved but will ask for pets sometimes. Daisy does not do well with children and she bullies other dogs if they let her. She does fine left in the house and would be a great companion for an older person, working or retired. She would benefit with training and seems to prefer men. She would like to play with other dogs but has intimidated the dogs in her foster home and no one can read her and therefore are afraid of her. Perhaps a bigger dog or similar breed would be good for her. Daisy is on allergy food but I have not seen evidence of allergies with her. She eats well and loves pumpkin and green beans which she has been getting regularly. She will sit and lie down for a treat. Someone has worked with her and she is bright and funny. But she will need a strong leader to make her realize she is not the boss. 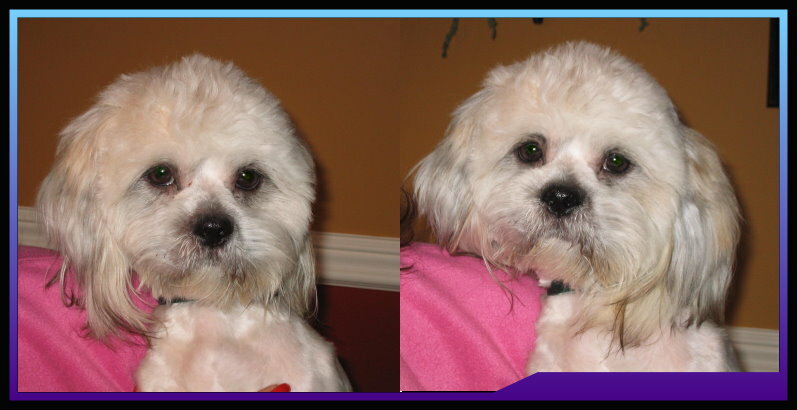 Barkley is a great little dog he enjoys playing or just sitting on your lap. He does great with the other dogs in my house even the old grumpy one he just walks away even after she tried to bite at him he is like ok lady you have some issues I will stay away from you. Barkley loves his ball and is more the willing to play at anytime. He loves to be groomed bath and all. He does great with people he does not know in my house as long as they leave him alone till he trust them. He does not like to share his food and will let the other dogs know he is eating right now and they will have to wait. He sometimes does not want to share his toys. 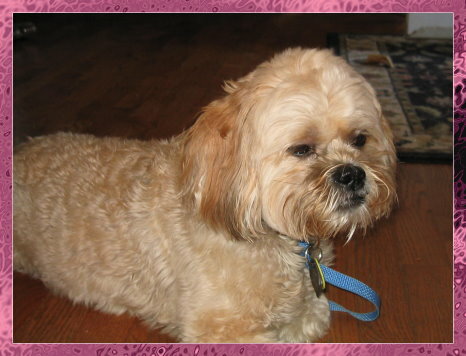 Barkley would do best in the home as a only dog or dogs of similar breed, he love to be the center of attention. Even better he likes to be in the car with the heat on. He was a angel at the groomer. He would love to keep you warm this winter and give you all his love. He does very well at letting you know he needs to go outside to got potty and is 90% potty trained. Barkley is ready to give you all the love he has and make you smile with his cute personality and sweet face. *Shadow passed away April/14 from complication from diabetes"
Shadow or my affectionate name for him is Moon Shadow. 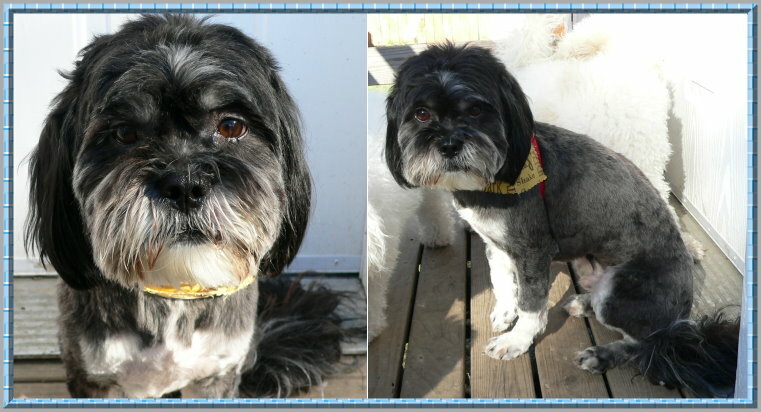 Shadow is your typical Lhasa boy, needs to figure out who is the leader, and once he realizes it is not him, he is awesome. He loves to play with another one of the fosters here. Loves to go for walks, loves his snuggle bed to sleep in, will toss toys, chew on hooves. He listens so well, he is smart, curious and a good boy. He only needs someone who understands and appreciates the breed. He is a joy to foster. Hi I am Webster I am very nice mellow boy. I have had a very rough life . I am scared of the camera or things in your hand. I do need to be in a quiet home. I don't like it if someone says something loud it really scares me. I could be with another dog or just be the only dog. I love to cuddle up next to you, I need the security to know I am safe. I love attention we could be best friends and you could show me how the good life can be. I am very loyal to my person I look so forward to having my own home with someone who will love me and treat me right and love and care for me forever and who will never break my hart or hurt me. I am good on the leash and I sure would like to go for a walk with you. I am very close to being 100% potty trained. I like to go outside to do my business and come right in. 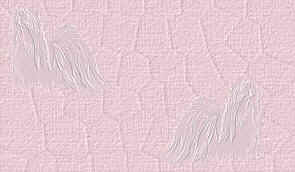 I have good manners and I really like men more then I do woman but I could be with a man or a woman. I do good with new people who come over, I am shy but I will warm up to them and let them pet me. I do not really bark much even when someone comes to the door. I hope that you will open your hart and your home to me and give me the love and treat me the way I should have been treated. I will show you how wonderful I am and with time and love I will come out of my shell and be a very happy out going little guy. Tori is housetrained, is animated when she meets new people, does well with the resident dogs (don't know about cats, or pesky puppies) She loves the comfort of a soft doggie bed, or a people bed...just loves cushy and soft, as most Lhasa do..
She loves to play with toys, and would love the other dogs to play with her..she is a nice lil gal. She is absolutely blossoming in foster care, now plays with the other Shih Tzu in foster care now, she does prefer her own kind to play with...follows you everywhere, and is becoming a very social and happy lil girl. She will be a sweet endearing companion for the right home. Koko is a very sweet and mellow boy who was owned by one lady for all his life. Unfortunately he was given up because of possessiveness of his person. He would get very insistent on her staying and he has some separation anxiety. He has been shaved down from his original furry self to a handsome short coated doggy. he was darker colored when his coat was long. He walks very well on a leash, does not pull unless frightened. He is eating fine now, not fussy about food and he eats dry kibble. He has been vetted and is dealing with an ear infection at present. He gets along fine with all the small dogs here even the snarly, growly one who wants to boss everyone. He has not barked yet so it appears he will be a quiet dog. He follows me everywhere as fosters generally do. He likes to sleep on the bed pillow though he will sleep at your feet when watching TV, eating etc. He just wants to be with you. He would do best with a person who is home most of the time. I don't know about cats or children. Initially he was a little standoffish but now he likes everyone here. That took a few hours only. He took to crating without much complaint as well. Meet Jack, this boy has some endearing and quirky qualities. First, anyone who has met this boy, raves about his beauty. Unfortunately the camera does not like him. No matter how many pictures I take they seem to not show him well. Jack will jump in your arms from the floor. Jack will sit on your lap and cover you with kisses. Jack will run through the house with his pink car, (out of all the toys in my home, he always has this toy..and I have already had to sew it up a few times) as he loves to play tug of war with you, or happily toss it around. He will scratch at the door when he has to go out. Jack is happiest in a home without rambunctious dogs. Jack will turn himself inside out when you return home, with tail wagging and barks of glee. He is an easy dog to live with, as he really does not ask a lot, mostly to be loved. His quirks are, when you leave, if you have keys in your hands, he will slam the door behind you. It is his way of saying.."how come I can't come"...he can be a bit barky also, but he settles down, and happily sleeps till you return home. He did have an ear infection when he first came into rescue, because it had been left for a long time, he had been scratching at his ears, the groomer was unable to save the fur on them, but the fur will grow back. Below is a picture of him, when he first came in. Awesome lil girl quickly found her home, now residing in Hoodsport, WA and in memory of Teddie and Maddie.